The rug is beautiful. Just as described. Adds the pop of color I needed. 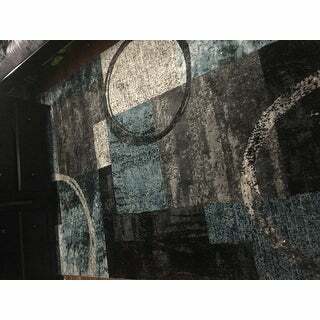 Compliment the abstract design elements already in your room with this indoor area rug, complete with contemporary overlapping geometric shapes. Stain-resistant polypropylene, in a contemporary patchwork design, makes this marvelously stylish and stunningly versatile area rug both easy and simple to maintain, to boot. 2 feet wide x 3 feet long x 0.3-inch pile height / weighs 3 lbs. 2 feet wide x 7 feet 2 inches long x 0.3-inch pile height / weighs 5 lbs. 3 feet 3 inches wide x 5 feet long x 0.3-inch pile height / weighs 6 lbs. 5 feet 3 inches wide x 7 feet 3 inches long x 0.3-inch pile height / weighs 14 lbs. 7 feet 10 inches wide x 10 feet 2 inches long x 0.3-inch pile height / weighs 29 lbs. 9 feet wide x 12 feet long x 0.3-inch pile height / weighs 38 lbs. 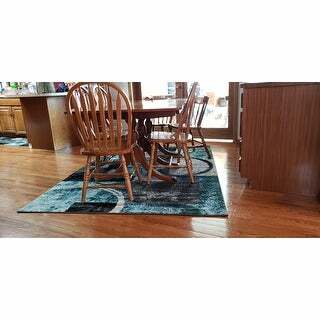 Great color to the rugs, but very thin and doesn’t stay on the floor. Need some rug tape to make stay flat on carpet. I also ordered the 8x10 as well as the runners. The runners showed the color concept better than the bigger one, but still great color. I very much like the design of the rug and the way they lay on the floor without curling at the corners. However; I ordered a 5'3" x 7'3" area rug for my living room. I received instead, 2 3' x 5' rugs, even though the delivery receipt shows the larger rug. 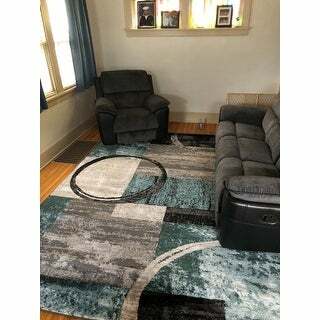 I went on-line to check the Overstock site and found that the larger rug is no longer available in the blue color, so decided i would attach the two smaller rugs to make one larger one. However I still end up with a 6 x 5 rug instead of the 5 X 7 I ordered. Somewhat disappointed in the way it was handled but I do like the rug itself. Love this rug! Colors looked just like the picture. I have received so many compliments already. One corner was slower to lay flat but seems to be getting better each day. This is a beautiful rug. It has beautiful colors, but it is not very thick. I don't think it is cheaply made, just not a super high quality, thick, "durable" rug. But for the price, I think it is totally worth it. The colors are just like the picture indicated. I've only used it a couple of days but it fits perfectly under my table. I would recommend the rug to others. Better looking than the picture, colors are awesome. 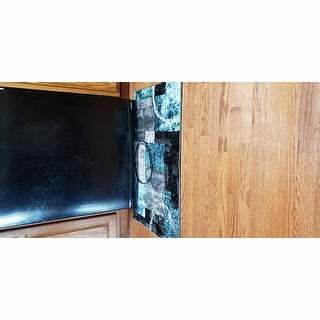 The quality is just what I expected, I have always been highly satisfied with the products from Overstock. Great quality. Good colors, not to loud. Exactly as pictured. Was alittle hard to get it to lay flat after it had been rolled. 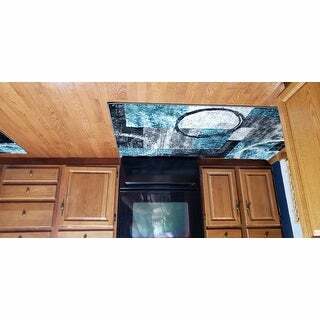 But looks great. Now I need the runner the match. 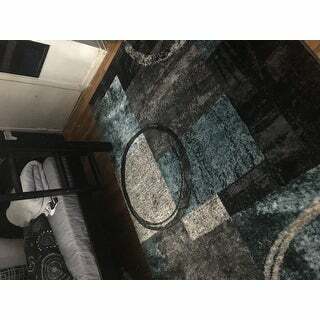 I highly reccomend this rug. I love this carpet. It looks great in my family room and the colors are perfect with my decor. Get lots of compliments. Beautiful cool colors, a little on the thin side but not a huge factor. Love it wish they had all my sizes!! The carpet looks really nice in my bedroom. It is soft and plush to walk on and it’s held up well since we bought it. Colors are vivid like in the picture. 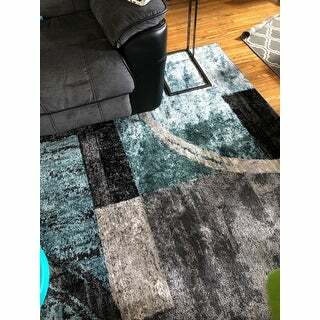 I absolutely love this rug. I am returning it only so I can get a bigger one. The return process was simple and quick. Love, love, love these colors!! I ordered all different sizes from the small rug to the large rug for under the table. Everything looks great. You do need to put anti slip material under them. I have them on wood floors and they do slide some. I did lift up my stove and slid the edge under so the stove keeps it from moving. I would recommend if you don't mind using the anti slip material. Love this rug! The colors are vibrant and it has a soft nap. We love this rug and it gets so many compliments. We have it in foyer, and it gets a lot of traffic and is easy to vacuum and keep clean. 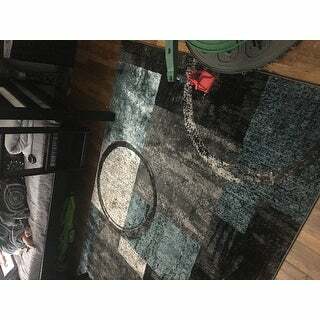 When I got the carpet I truly wasn’t very satisfied just noticing how thin it was wondering that is wasn’t going to be very soft and was going to feel like stepping on floor instead of carpet but when I did open it up it was a bit bigger than I thought and the design was beautiful. My boys loved it very much since I just had bought them new furniture for there entire room. It’s very soft and ok I just wish it was a little thick but if my boys are happy I can live with it. 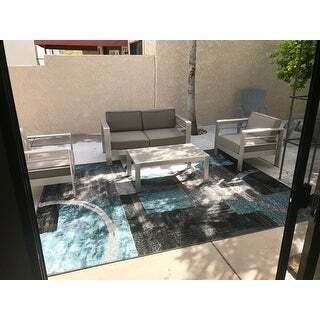 This rug is absolutely beautiful and looks stunning on our covered patio!! Although it is indoor use only, we are temporarily using it there for now. Will be ordering another one. It is more vibrant than the picture and soft on your feet! We absolutely love this rug. Matches our furniture well in our basement living area. Definitely recommend this product. It’s spacious and unique they also have matching rug in different types of shapes. "Is the “blue” aqua blue or aqua green or both ???" "Hi, What is your return policy? Do you pay for return shipment? I am interested at this rug and some other from your OSTI shop. Thanks"
Thanks for the info. I already checked before asking question. For marketplace they want to ask directly. Are you a seller on the marketplace? I appreciate if you can answer directly. I am postponing my purchase till I get detailed answer. "Does this rug come larger than 8x10 ?" "What type of fiber is this? is it "fluffy""
"Do you have this rug in 3’ x 5’?" "How soft is this rug?" It's soft, but not a very thick rug. I really like it! "Is the color more of a blue or teal?"